In 2002, Vienna Teng had a Stanford degree and a job at Cisco. She chucked it all to pursue a music career. Her gamble is finally paying off. I've heard the entire CD and there's not a dud on this. THE MUSIC drifts through shelves of children's books: plaintive, folksy, with whimsical lyrics about places and characters that wash up during travels. Here on the second floor of the Palo Alto Borders Books and Music, fans of Vienna Teng throng to hear the 25-year-old Stanford graduate plink out a short set on her Yamaha keyboard from her new album, Warm Strangersa bulk shipment delivered that day to her mom's Saratoga address. Stanford student Miki Nguyen, 22, clutches a freshly signed CD. She listens to pop like Travis, Coldplay and Sarah McLachlan but holds a sacred spot on her CD rack for her Stanford soul sister. "She's very genuine, she has a lot of depth; we all relate to her," she says. "She's creating her own pool to wade in. It's something I can relax to, go to sleep toand to calm down my boyfriend who has ADD." Mark Weiss, a local booker also queuing up in the Sharpie scrum, sums up Teng this way: "She's the straight-A, overachieving version of Tori Amos." In a music industry where women's well-ventilated outfits get more attention than actual talent, Vienna Teng is an anomaly. She graduated from Stanford and was a cubicle jockey at Cisco before she made the leap from direct deposit to tip jar. The decision displeased her parents, but on this night it seems all is forgiven. After the in-store performance, Vienna's mother sells tickets to her daughter's concert that weekend at San Francisco's Cowell Theater. The show is up against the Oscars but sells out. Teng herself claims she never went through a rebellious teenage period but she thinks she's going through one now. "One of the first things I was rebellious about was insisting on doing music and giving up a steady paying high-tech job to do it," Teng says, sipping hot tea at a Westgate coffee shop a week before she leaves on a month-long national tour. "I knew it was something that would bother my parents and disappoint them." Vienna Teng grew up in Saratoga, attending Argonaut Elementary School and Saratoga High. She learned piano at 5 and took classical lessons until she graduated from high school. The first concert she went to was a performance of Beethoven's Eroica Symphony at the Flint Center. "I remember being moved by the massive scale of the performance; there were so many people who were producing this sound live. Each was playing their individual parts. I was very impressed by it." As a young girl, Vienna wrote short stories and novels, making up people, worlds and galaxies because she was too lazy to research real locations. She would cast herself as a savior, conjuring up or dispelling magic spells and storms. "So now I have this whole planet that's populated with all these characters who have this rich human thought and history," she says. "I might write it all down some day." Her piano teacher, Chuck Fuery, gave her lessons in jazz theory and transcribing by ear ("He taught me to be expressive on the piano and to evoke things from the instrument that I hadn't thought of before"), but most of all, Fuery was a class motivator. In her junior year of high school, he asked her a simple question: What do you want to achieve and what will it take to get there? "I said I wanted to be a composer and songwriter, and I shrugged it off," she says. "He made me walk through this whole plan. He took it down from this huge daydream in the clouds to how you can actually formulate a plan to do this. I was incredibly scared." 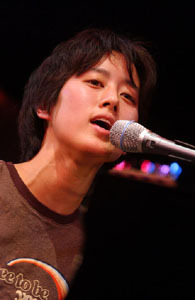 In 1997, Teng entered Stanford pre-med, studying biology. Halfway through, she decided it wasn't for her. Music had seeped into her bloodstream. She'd sneak into the Stanford music department to practice piano. She played for students studying in the dormitory lounge, graduating to the Stanford coffeehouse where she collected a captive crowd. With her interest in pre-med waning and music driving her train of thought, Vienna's internal drama culminated in a Saratoga living room one winter break. Unable to sleep, she padded out to her parent's living room, lifted her head and uttered the words that would forever alter her course: "I'm going to do music," she said. "This is what I'm going to do." "My boyfriend put it very well," she says. "He asked me a simple question: 'Do you live for your parents or do you live for you?'" To The Moon: Vienna Teng headlines the Montgomery Theater this Tuesday and Villa Montalvo in October. Back in 2000, it was still possible to ask at a job interview, "I have an outside interest in music, and I was wondering when I'm going to have time for that?" Teng's manager at Cisco encouraged the music. Cooped up in her beige cube, Teng allowed her imagination to wander. There's even a song on the new album called "Homecoming" about the rigors of touring that was written before she saw the inside of a Ryder truck. "I wasn't on the road at the time, I was at Cisco," she says. "I was trying to imagine what it would be like to be in that situation, mostly because I wanted to be somewhere else. The fantasy matches the reality very well." With a set list of songs, she moved on to open-mic showcases at Blue Rock Shoot, Espresso Garden and Red Rock Cafe, where she often competed with the noisy espresso machine. She played all originals, never stooping to play weddings or bar mitzvahs to pay the bills. Cisco did that. With two demos co-produced by friend Eric Miller, Teng built up a regular following. Then, when Virt Records founder Michael Tarlowe was looking for acts to sign to his label, he downloaded MP3s of Teng's "The Tower" and "Momentum" from a women's music website and was floored. He flew out to Mountain View to see her perform at Red Rock. Vienna rallied the troops by mass email to ensure a packed performance. Virt signed her immediately. "I thought there was something very special about her which is really different from anything else I heard," Tarlowe says. "There was sophistication in the lyrical context. They were all telling stories, but you had to spend time with them to understand what the story was. She had a great sense of melody." Waking Hour was rereleased with three tracks produced by David Henry (Cowboy Junkies, REM) on Virt in 2003 and has since sold 26,000 copies. Warm Strangers is four months old and has already sold 17,000 copies. In early March, both albums appeared in Amazon's Top Seller list, ranked No. 3 and No. 2, respectively. Teng received a couple of good breaks. An opening slot at last year's Shawn Colvin show at Montalvo culminated with an autograph session that went 20 minutes into Colvin's set. Sports Illustrated gave Waking Hour a thumbs-up with the line "The best new Guaranteed-to-Get-Her-in-the-Mood-Because-She-Can-Tell-You're-a-Sensitive-Guy music." NPR did two 10-minute profiles on Weekend Edition. After the first segment played, her CD shot up to No. 8 on Amazon, and she was inundated with management requests and new fans. One fan, David Letterman, tuned in, got the CD and booked her on the Late Show. Teng got the call one Friday in January 2003 to play that Monday. She floated around her Mission District apartment that weekend trying not to freak out. "I remember spending those three days in a very deliberate calm," she says. "Like, 'This is not a big deal; it's just a trip.' I put myself in denial." Thankfully, she did not bomb on Letterman. His lead-in praise was promo-copy heaven ("I've heard the entire CD, and there's not a dud on this"). Teng and the Late Show band killed "Gravity," and she and David awkwardly embraced at the end of the song, momentarily replacing Minnelli and Gest as mismatched couple of the year. "I learned that nothing really bad happens if I'm put in high-pressure situations," she says. "That was really good to find out. I could do what I had to do without any big disasters or nervous breakdowns." Teng has since appeared on News Night with Aaron Brown, the CBS Early Show and Wayne Brady's show. But for all the lucky breaks, she's up against tough odds for commercial success. Teng's music succeeds outside of the mainstream. She does well on specialty shows in small markets, like the Sunday Acoustic Breakfast program on KFOG. There is no corporate radio station specializing in quietly exquisite, classically influenced folk pop, but recently "Hope on Fire" was added at five stations, including KBAC, an Albuquerque/Santa Fe station owned by Clear Channel. "It remains an uphill battle," says Michael Tarlowe. "We are experiencing forward progress and making important strides." There is also a sexist element: program directors schedule multiple male singer/songwriters (Jack Johnson, Jason Mraz, Coldplay, Five For Fighting, et al.) in succession but restrict their female intake. You'll never hear Dido and Norah Jones back-to-back on commercial radio. And then there's Vienna's image: "On the cute side of plain," as she admits. When she searched for representation, two L.A.-based managers made inquiries. Their first suggestion: Get thee to a stylist. "They really liked my music, but it became clear they were trying to make me the biggest new thing," she says. "They asked me this rhetorical question: 'Surely you want to be successful?. You want to be the biggest new thing.' Strangely enough, I don't know if I want to be. They had a completely different focus. So they didn't pass on me; I passed on them." More important to Teng are the songs. They traverse classical and contemporary skylines. Lyrics wrap around arrangements with feline insouciance. Piano and strings bring color, detail and drama while drums add sinew. Teng has the omniscient eye of a playwright and the sensitivity of a cool babysitter. She compares good lyric writing to "staring at something and painting what you see in your peripheral vision." Waking Hour introduces Teng as an ace storyteller. "Momentum" expresses the desire for a lover to get over reticence. "The Tower" is an indirect explanation of why women are from Venus. Songs like "Daughter," "Eric's Song" and "Say Uncle" are quiet, reflective pools to relax in, rippled only by Teng's crystalline voice. If Waking Hour was a tentative step forward, Warm Strangers finds Teng hitting a comfortable stride. The contemporary band structure is fully fleshed out, with organ, marimba, oboe, slide guitar and string sections. For Warm Strangers, Vienna traveled to Nashville to record again with David Henry. Financial constraints forced Vienna and her recording team to be creative. On the a cappella "Passage," they couldn't decide whether to use weird sound effects or chopped-up field recordings. In the end, they went to a tunnel underneath a Nashville bridge and let the tape run. "We padded down there in our flip-flops and recorded with all this natural ambient reverb, and it was perfect for what we were looking for," she says. The bridge is credited in the liner notes. On Warm Strangers, Teng also adapts "Green Island Serenade," a Taiwanese folk song that her parents sang to her. She sings in Mandarin a song that has double meaning. One can be defined literally about missing someone far away. The other is about political exiles that miss the country they left behind. Vienna came upon the double meaning only recently. "They felt distance from this thing they loved deeply," she says. "'Here I am on this green island tonight, and everything is really peaceful, and if I sing this, maybe it'll carry over to where you are. So why aren't you saying anything to me, how can you stay so silent?' You can think of it as singing it to a lover but also think of it as someone in exile singing it." Current events also slip into songs like "Shasta," which was inspired by the 30th anniversary of Roe v. Wade, "Soon Love Soon" and the activist anthem "Hope on Fire." But Teng excels at songs that detail affairs of the heart. "Decade by One" is a quaint reflection of a thirtysomething mother looking back on her 20s. The fan favorite "Harbor" is the closest thing to a straight pop song. To a sprite piano riff and tempo, Teng sings, "The light in me will guide you home / All I want is to be your harbor." For tenderness, "Harbor" stands up to anything by Sarah McLachlan, Michelle Branch or Vanessa Carlton. Teng gave her notice at Cisco in 2002, after building up a tidy nest egg and deciding to tour the United States by herself. No agent, road manager, label guy, merchandise seller or roadiejust Vienna, a keyboard, a PA, a road map, a cell phone and a mug of coffee stuffed in a minivan. She'd play shows, sell some CDs, pack up her gear, then head off to the next town and do it all over again. She'd hit a hotel or pull off in a residential neighborhood to get some sleep. Vienna admits to resorting to desperate measures to remain awake during one long stretch between Pittsburgh, Pa., and Rochester, N.Y. "I did a lot of yelling and listening to really loud music," she recalls. "I found that if you yell, it's hard to fall asleep. It works for five minutes if you need to stay awake until the next exit. I usually yelled expletives. Anger is useful in staying awake. That's the refuge of the desperate." It's hard to imagine petite and soft-spoken Vienna Teng cursing a red streak along the highway, but there's a little slice about Vienna that's intentionally deceiving. The fictional songs are one thing. Then there's her name. Vienna Teng is not on her birth certificate. At age 11, she dreamed up different pen names or stage names, and settled on Vienna after the Austrian capital and added Teng to honor her Chinese roots. She still goes by her birth name to friends, family, Uncle Sam and the DMV, but she won't divulge it to the public. "It's gotten to the point it's silly," she says. "I have a group of friends who know me as one name and another group who knows me as the other. I would take it back if I could, but it's gone too far to take back." Splitting her everyday and musical identities affords her dual senses of privacy, security and sanity, as if the success, autograph requests, television appearances and adulation is happening to someone else. "People ask me if its weird to see my name in the newspaper or on the marquee, and it helps that it's a name that I made up," she says. "Then it's not so weird. Like it's some other entity that I work on but that's not really me and I get to keep [the real] me a little more private." Teng's success isn't simply a triumph of substance over fluff. Her status as a young Chinese woman playing piano outside the "classically trained prodigy" realm signals a significant shift in cultural perception. She takes the popular stereotype of a cold, studied, concert pianist virtuoso and gives it a shot of warmth, emotion and sensitivity. In doing so, Teng stands proudly next to other current, genre-busting Asian American musical icons like Chad Hugo, Jin Tha MC, Jasmine Trias and evenyikesWilliam Hung, who do it for the love of music. Teng offers Asian Americans a new type of musical role model. But while some of her Asian American fans might support her just because she's Asian, they're outnumbered by those that support her because she makes music with substance. The Borders in-store appearance, weighted by a predominantly Asian audience, hints at a combined demographic double shot. If Vienna's music inspires an Asian prodigy to pick up a Tori Amos record, or a white Tori Amos fan to pick up a Vienna Teng record, radio and MTV could sound and look very different in a couple of years. And Teng is on a roll. She just returned from a two-month national tour with violinist Alan Lin and cellist Marika Hughes. Along the highways, Teng came face to face with the people who took ownership of her songs. She met couples who adopted her songs as wedding music. She learned about listeners who were inspired by the spiritual tone and introduced them into religious services and, in the case of a Stanford student, as a soothing companion to an ADD-addled boyfriend. Teng was overwhelmed by the distances some would travel to see her play. One woman drove from Phoenix to Los Angeles. Another drove from North Carolina to Atlanta. "People are looking for something to be part of the soundtrack of their lives, to somehow describe a moment they're going through," she says. This Tuesday, Vienna headlines the Montgomery Theater before taking off for a 11-date trip opening for Mason Jennings and Over the Rhine. In October, she takes over her own backyard at Villa Montalvo's Garden Theatre. It's a culmination of years of hard work and planning that began in a Saratoga living room, fermented in a Cisco cubicle and was nurtured in coffeehouses and open-mics. As radio airplay builds, Teng finds word of mouth from perfect strangers her strongest selling point. "With each month that goes by, there are more people who share my music with more people," she says. "It's a good way to do it. For some people who are overnight sensations, it really messes with their heads. I feel I've had a lot of time to adjust to whatever comes my way."